GLEN ELLYN, Ill. -- Ted Cruz suggested on Monday that it would take Donald Trump shooting somebody in New York City to not support the current front-runner in the general election if he becomes the Republican Party presidential nominee. "Well I can give you one example where I would no longer support Donald Trump," Cruz told reporters in Rockford, Illinois. "If, for example, he were to go out on Fifth Avenue and shoot somebody, I would not be willing to support Donald Trump." Reporters pressed Cruz on Monday why he would continue to back Trump despite suggesting over the weekend that Trump "encourages violence" and "disrespects voters." Since the first GOP debate, Cruz has maintained his commitment to supporting the eventual Republican nominee next November. He continued to hold the line on Monday, telling reporters, "When I tell you I'm going to do something, I'm going to do it." 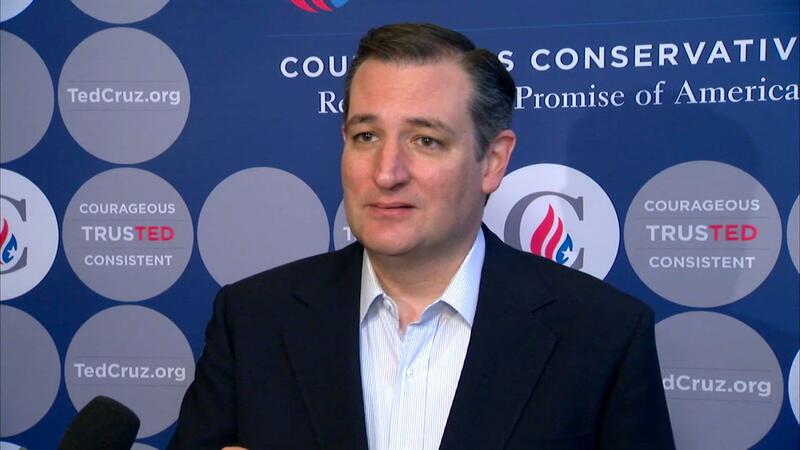 Cruz continued: "At the outset of this campaign, I committed to support the Republican nominee, and I honor my word. And honoring your word means actually honoring your word. You do what you said you would do." The Texas senator also said over the weekend that Hillary Clinton "would do even more damage" to the country and be "the lesser of two evils." His comments Monday referenced a statement Trump made earlier this year, saying his supporters were so strongly behind him that "I could stand in the middle of Fifth Avenue and shoot somebody and I wouldn't lose voters." Marco Rubio and John Kasich cast doubt this weekend over their own pledges to back Trump after the candidate welcomed violence at his campaign rallies. Rubio told reporters earlier on Saturday that it was "getting harder every day" to see him putting his backing behind Trump. And Kasich condemned the "toxic environment" harvested by Trump, adding Trump's recent actions are making it "very extremely difficult" to support him. Cruz also continued his push on Monday for Rubio and Kasich to leave the race and narrow the field into a head-to-head matchup with Trump - a duel Cruz's campaign believes would allow the Texas senator to still win the GOP nomination outright before this summer's convention. As part of that call, Cruz told reporters he is open to the pair joining a potential Cruz administration. "You know, going forward, look, of course, I could absolutely see a place for Marco Rubio and john Kasich in an administration," Cruz said. Cruz is making a five-stop swing through Illinois before the state's primary on Tuesday.